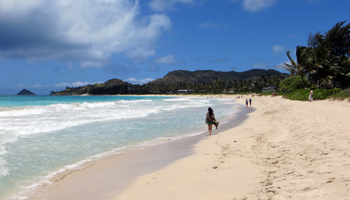 Hawaii Beaches: East Shore Oahu. 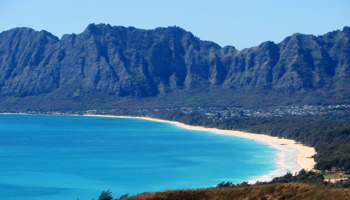 Oahu’s east shore – or windward side, as it’s more commonly called – is where I grew up. 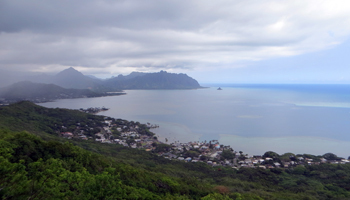 I lived across the street from Kaneohe Bay and spent most of my youth out in the bay, and/or at numerous nearby beaches, fishing, snorkeling, surfing, boating, and goofing-around. To my biased mind, east shore Oahu is the most beautiful part of this island by far! And as for the beaches… they’re gorgeous! Just look at the photos. In many respects, these beaches are the very definition of island paradise. Every one of them is a Corona commercial waiting to be filmed (except Kaneohe Bay, where such a commercial was already filmed). East shore Oahu is incredibly lush – with trees and plants growing right out to the edge of the sand, and sometimes even with mangrove forests that extend beyond the water’s edge out into the tidal flats. The beauty is breathtaking, and it’s also good for some convenient shade. Then, as I mentioned, east shore Oahu is the windward side of the island. That means the Pacific trade winds blow directly on-shore almost constantly. For cool comfort, this makes these beaches the best, again! Furthermore, with only a few exceptions, these beaches are often deserted. You can have whole beaches to yourself if your timing is right. And even the most popular spots seldom get the kinds of crowds you’ll encounter almost daily on Waikiki Beach. So what’s not to like?!! 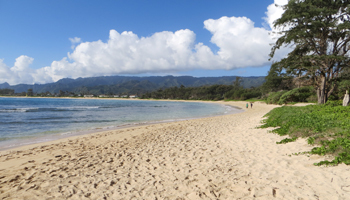 Unfortunately, the on-shore trade winds also mean windward Oahu is where the clouds usually blow ashore; so your chance of getting an overcast/rainy day at the beach is significantly higher than on the other three shores. That rain is exactly why this side of the island stays so lush. A drawback of the vegetation, however, is that one of the most common trees found growing right up next to the sand for the entire length of the coast is an evergreen called Ironwood. This tree drops thousands of green-grape-sized pinecones that are brutal on bare feet. This isn’t a big deal, but it’s a bit of a nuisance. Although I don’t really care for the seaweed, driftwood, and random bits of debris that blow ashore along this side of the island (you can see lines of washed-up detritus at the high-water mark in some of the photos), if that was all that washed ashore, I wouldn’t even mention it. 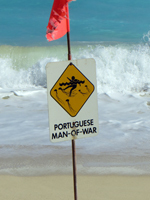 The bane of existence growing up in the water on east shore Oahu was the Portuguese Man-of-War! 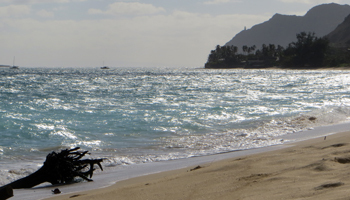 Along the entire windward coast – the longest stretch of coastline on this island – the only east shore Oahu beach where I’ve never encountered a Portuguese man-of-war is Makapuu Beach. These little coin-sized bubbles of terror have encountered me at every other section of shoreline all the way out to Kahuku. And each encounter gets more and more unpleasant! I’ve been stung by these little floating ninjas – some with stinging tails more than two meters (approximately seven feet) long – more than 25 times throughout my youth. It finally got to the point that I said: three other shores of Hawaii beaches never have a single man-of-war… and three out of four isn’t bad. I’ll just stop going to the east shore Oahu beaches. Throughout at least the last 12 years, however, I’ve started going back to the east shore Oahu beaches just as frequently as I go to all the others. But I always walk along the high-water mark first to see how many of these vile critters have been washing ashore. And when I go out in the water, I’m always on the lookout for the bubbles with the blue tails of doom. 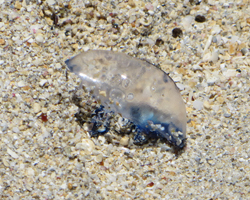 Even though I see at least one man-of-war (usually more) washed up in the sand every time I go to these beaches, I’ve managed to avoid being stung for at least the last dozen years (knock on wood). So I love the east shore Oahu beaches themselves; but I hate the fact that I can’t just let down my guard and relax for fear of getting zapped. Located across the street from Sea Life Park at 41-202 Kalanianaole Highway in Waimanalo, Makapuu Beach is a popular spot for bodysurfing and body boarding. Surfboards are not allowed. It has a wide, sandy beach; and a sandy bottom way out into the water. Just be careful, because the waves are kind of rough (which is why it’s popular for wave-riding); and the sandy bottom tends to drop-off unexpectedly when you’re just a few meters out into the shore break. This sudden drop can get people into trouble if they’re not very adept in the water. So it that’s you, and you’re nervous about your water abilities, choose another beach and/or call the Hawaii surf report at 808-596-SURF (7873) before you go. You want the surf report to say “flat to maybe half a foot”. But if it says Makapuu is “one to two-ooh” or larger, that’s for people who know what they’re doing. For the sake of convenience, I’m consolidating Bellows Beach Park (along Tinker Road in Waimanalo), Sherwood Forest (aka: Sherwoods), and Waimanalo Beach Park (both along Kalanianaole Highway) into the one long, beautiful strip of beach that I’m referring to as Waimanalo Beach. Bellows is divided into two sections, one of which is exclusively for military use and another that’s open to the public. Sherwoods is almost identical to Bellows, but often less crowded. And the actual Waimanalo Beach Park has more park facilities (fields, pavilions, etc) than just what you find at a beach. Waimanalo Beach is great for child play. Unlike most Hawaiian beaches, the sand tends to be very fine, which is good for building sand castles. And the sandy bottom stays shallow for several meters out into the water, which creates a decent body boarding shore break that’s fun for newbies and kids. If it wasn’t for the occasional man-of-war, these beaches would be almost entirely hazard-free and practically perfect for anybody trying to get their first taste of wave riding. For the sake of convenience, I’m consolidating information about Kailua Beach Park (at 526 Kawailoa Road) and Lanikai Beach (multiple locations along Mokulua Drive in the Lanikai neighborhood of Kailua). They’re right next to each other and very similar – except that it’s a little trickier trying to find public beach access and parking in Lanikai. 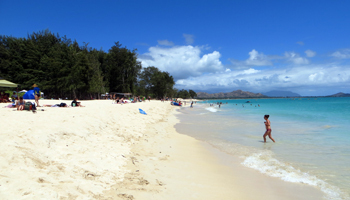 Kailua Beach is probably the most crowded beach on east shore Oahu – especially on weekends and holidays (visible in the background of this photo). At one point, some tour operators were hauling people in by the busload; but I think commercial use of the beach has since been restricted. This beach has some of the finest sand you’ll find anywhere on Oahu. It’s great for making sand castles and great for water play without any need for reef walkers. There’s a bit of a shore break for body boarders. And there’s always plenty of wind for windsurfers and kite surfers. Kailua Beach Park also has party pavilions, which explains part of the reason this beach is so popular with the locals. I could just have easily have consolidated Kalama Beach Park (at 248 North Kalaheo Ave in Kailua) into my review of Kailua Beach, which is just down the road (and visible in the distance in this photo). The stretch of sand between them is unbroken; and the advantages are identical. But I had another nice photo I wanted to include; and this could be your opportunity to enjoy Kailua Beach while avoiding some of the crowd. 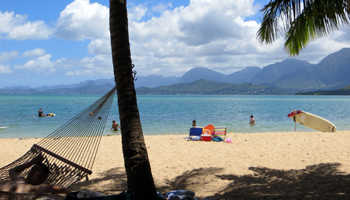 Enjoying the beach at Kaneohe Bay is a little trickier than everywhere else on east shore Oahu. 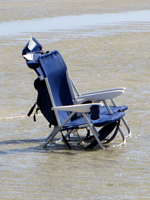 Although there are several beachfront parks and boat harbors, there are basically no easily-accessed beaches. 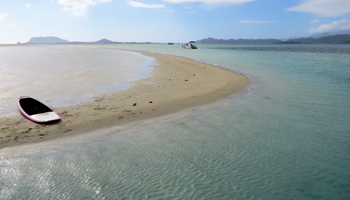 In fact, there are only two places with enough sand to call them a beach: Secret Island (which is a privately-owned area with a paid tour) and the Kaneohe Bay sandbar (which you can only get to if you have access to a boat). I’ll talk about Secret Island elsewhere. Meanwhile, if you do have access to a boat, you’re going to love the sandbar. What could be better than a beach that’s absolutely surrounded by water?!! You can snorkel, but there’s usually not much to see (other than the dozens of green sea turtles you’ll pass on the way out to the sandbar). But for a full-day of water play, this place is awesome! When I was growing up, we always had a boat and/or friends with boats, so I used to go to the sandbar fairly regularly. Need access to a boat? 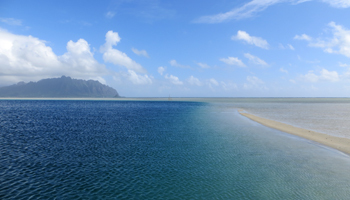 This is one of those Hawaii attractions that’s worth paying for, so you might want to book a tour: Kaneohe Bay Sandbar - CLICK HERE! (Link opens a new window/tab). 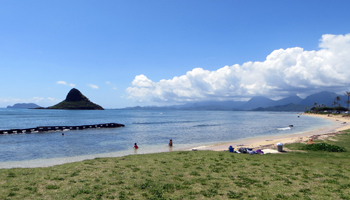 On the northwestern tip of Kaneohe Bay, by the Chinaman’s Hat islet (49-479 Kamehameha Highway), you can enjoy the beach at Kualoa Regional Park. There’s plenty of sand for laying out mats and catching crabs; but there’s not much sand out in the water. Most of the near-shore seafloor is rocky, so you’ll want to have reef walkers. Depending on water conditions, the snorkeling can be decent at this location. Your probability of seeing green sea turtles is fairly high. Just exercise caution and good judgment, because I’ve heard several reports throughout the years about people getting themselves into trouble trying to cross over to the islet. And if it has been raining and/or when conditions are choppy, I wouldn’t even bother trying to snorkel. The water can get much too murky. But even though the water conditions can get rough, don’t count on finding any wave action for body boarding. The main appeal to a day at Kahana Bay is its near-total isolation (around the bend to the northwest from the Crouching Lion Inn at 51-666 Kamehameha Highway in Kaaawa/Hauula). There might be some people camping and/or fishing there. Otherwise you’ll probably have the place to yourself. This Hawaii beach just doesn’t get many passers-by stopping in for a swim. There is a small strip of sand at the back of the bay; and all the surrounding area is heavily vegetated. A stream flows into to the bay, which can make both the sand and water a bit too full of silt for my liking. Thus it’s not usually a great place for snorkeling. Nor is it an ideal place for your kids to play, due to the rocky seafloor and somewhat muddy beach sand. There’s seldom any surf, but it’s a decent place to go wind surfing and/or kite surfing. 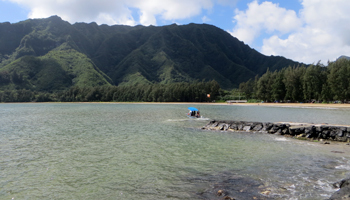 I usually go to Malaekahana State Recreation Area, at 56-020 Kamehameha Highway in Laie, for family camping trips. But even with the campgrounds, this beach never gets particularly crowded. It has tons of clean white sand for your children to fill their buckets (and their shorts). Most of the seafloor has a rocky bottom, but there are small patches with a sandy bottom where the kids can play. This beach is seldom calm enough for snorkeling, but it’s one of the few east shore Oahu beaches that gets a decent surf break. Just keep in mind that it can be quite shallow and you’ll need to be careful. One of the unique features of Malaekahana is a near-shore bird sanctuary called Mokuauia or Goat Island. This little islet has its own sandy beaches, and it’s easy enough to wade over (as long as you come prepared with reef walkers and/or floatation devices). If you do attempt the crossing, just be aware that the cross-currents can make things a little rough. If it looks too rough, don’t go. 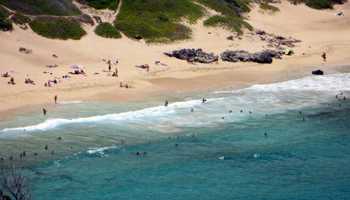 The reason many of these beaches stay deserted is their distance from Honolulu. If you’re lodging in one of the Waikiki hotels or the Ko Olina Resort area (Aulani), you will have to drive for 45 to 90 minutes to reach some of these spots (maybe even longer depending on your route and point-of-origin/destination). If I were you, I’d plan to enjoy the Windward Oahu scenic drive and just stop at whatever beach suits your fancy when want to get out of the car. 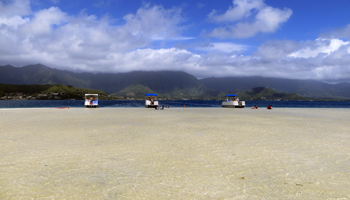 There are also some great beaches on Marine Corps Base Kaneohe Bay (my favorite surfing spots on the Oahu east shore), but you can only get there if you have base access. Since most Hawaii vacationers won’t have that access, I’m not including them in this review. 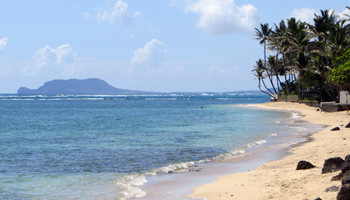 But if you’re going to be out on that base during your time in Hawaii, definitely go enjoy these beaches.